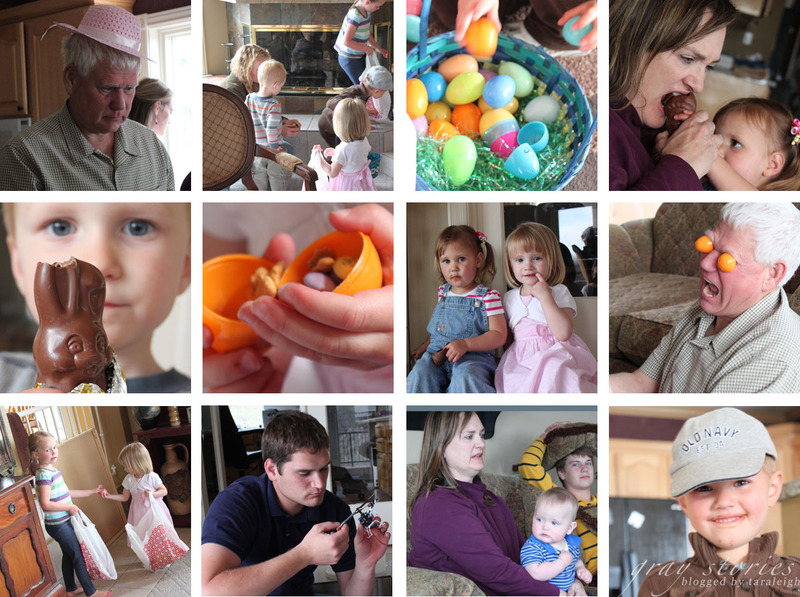 We spent Easter with Jordan's family. We got together on Saturday instead of Sunday because we thought the weather would be nicer... but of course Sunday turned out to be much nicer than Saturday. We still enjoyed ourselves. We had a little BBQ dinner and Grandma Gray put on a little egg hunt for the children. We did it inside since it was cold and rainy outside. The grandchildren all loved it. Grandma gave each of them a chocolate bunny so by the end of the day every child's face bore evidence of the chocolatey treat. As always, Grandpa Gray showed his silly side by pretending his eyes were made out of orange plastic egg halves. The picture looks a little scary, but it still makes me laugh! I forgot to bring Liliane's basket so she got to use a recycled target shopping bag as a receptacle for all the eggs she found.